Many years ago I was participating in a Kaizen (Japanese for “good change”) event and a laboratory technician asked if the nurses in the ER could stop putting the red STAT stickers on the lab tubes as they would sometimes clog up the machine. The nurse asked how the technician would know it was a STAT test without the sticker? The lab tech’s answer was, “we run all the ER tests STAT and have done so for years; the STAT label does nothing but slow down the machine.” What a waste! Think about all those years of buying those red stickers and putting them on the tubes just to slow down the machine and the lab technician. We laughed and stopped using those stickers that day – waste removed! While I was rounding in the lab at Clinton Hospital, I was reminded of the story above. The hospitalists had been ordering certain tests STAT that were batched together and run once per week. But because they were ordered STAT, the courier was called to pick up the blood in the middle of the night and rush it to the Medical Center where it would sit and wait. Using their idea system (see below), the laboratory suggested that we stop sending tests by courier that will not be run immediately. The idea has been implemented and thousands of dollars in wasted courier costs have been eliminated. 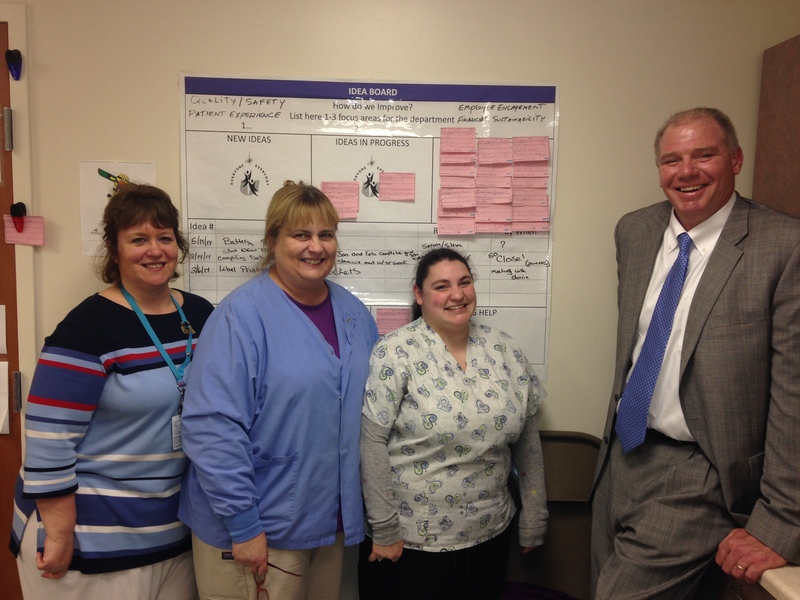 I recently visited with the lab team at Clinton Hospital. Pictured (L to R) Debbie Flint, Bettie Berndt, and Meghan Lafreniere – all lab technologists. Many thanks to the great care givers at the Clinton and Marlborough labs for allowing me to attend their huddles and giving me a tour of their idea boards. Your dedication to innovation and implementing the ideas of the frontline line staff is inspiring and a shining example of where we have to take our organization. I wanted to “Post” about a Very Positive experience I had while going through a difficult time with a back injury in your Hospital. I was treated like I was at a 5 star hotel and the service was great. From the time I was taken into see the doctor at the ER until my emergency surgery that evening. I can tell from reading your blogs and your management style why and how your staff and facility run the way it does. It starts from the top down, lead by example and you show that. I would love to share more detail on the people that really impacted my life because I think they really deserve the credit. I believe too many times people complain vs. taking the time to see the positive side of everything. A very useful lesson to share, thanks.